The ship is intended for a new type of "Club" concept world wide cruise operation. The design, interior layout and cruise operation is new and unique in many ways: one part of the "Club" concept being a very active passenger participation in many activites as well as new unique experiences not earlier seen at cruise ships. The luxury "Club" concept cruise ship, ordered by Deutsche Seereederei Touristik, Germany, in August 1994, was delivered the June 7th at the Finnish Kvaerner Masa Shipyard of Turku. In the same day took place the naming ceremony in Rostock, Germany. The new ship is the first cruise liner built at Kvaerner Masa Yards for a German owner. It was designed and built in a record short time of less than 22 months from the signing of the contract thanks to the efficiency of the yard, combined with the excellent cooperation between all parties involved: the owner, the suppliers, the classification society Germanischer Lloyd and other authorities. 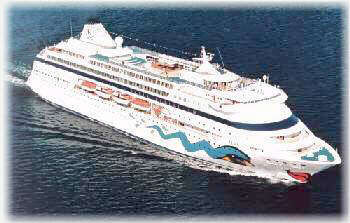 The 1,186 passenger "Club ship" was named Aida. 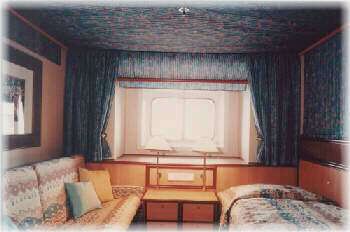 The ship is operated by the german Tour Operator Deutsche Seetouristik. The inaugural cruise from Bremerhafen to Palma de Mallorca taken place between June 11 to 21 after which Aida launched two alternating weekly cruises in the western Mediterranean from the base port of Palma de Mallorca (Spain) and will continue with cruises in the Carribbean after the summer season. 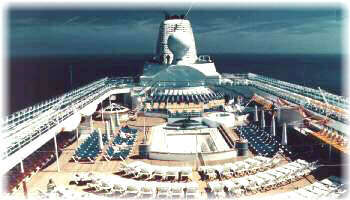 The Aida is intended for a new type of "Club" concept world wide cruise operation. The ship's design, interior layout and cruise operation is new and unique in many ways: one part of the "Club" concept being a very active passenger participation in many activites as well as new unique experiences not earlier seen at cruise ships. The Aida has a horizontal layout where the modern and colourful public areas, including restaurants and galleys, are concentrated on decks 8 to 11 and the passenger cabins distributed over decks 4 to 7. 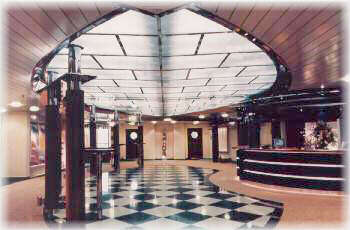 The main entrance hall, with reception, is on deck 6 which also is the ship's outside promenade deck. The layout of the ship was designed by the yard together with architect Kai Bunge of Partner Ship Design (Hamburg), who is also responsible for the interior design of the vessel. The vessel accommodates 1,186 passengers and has a crew capacity of 370 persons. In the forward area of deck 8 is the ship's two deck high main show lounge, "Das Theater", seating more than 540 guests. Aft of the show lounge on each side are two children's playrooms, the "Club 14" and the "Schatzinsel" behind of which is the large main bar and night club "Bar Aida" with a compass rose shaped bar counter. At the same deck aft is the shopping area and three separate restaurants with abt. 500 seats altogether, the a la carte "Maritim Restaurant", and a large Market buffet type restaurant, "Marktrestaurant", the aft part of which has a panoramic view aft. The galley area is placed on the starboard side in vicinity of the restaurants. On deck 9 aft of the show lounge is the unique and spectacular inside "Fitness Felsen" Laguna area with a fitness center, whirpools, an aerobics area and a Beauty Parlour, the whole space decorated by palm trees, real looking rock and cave formations and a waterfall. The "Lambadabar" winter garden area behind is reached over a raised bridge. Behind the "Lambadabar" is the large "Karibik Restaurant", arranged in six separate differently decorated sections. 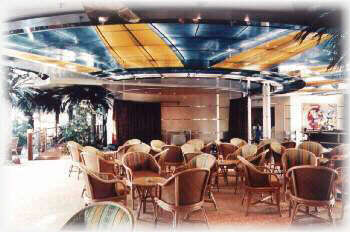 In the stern area is the large open air "Calypso Bar". The next deck above, deck 10, is the open sun deck with the ship's wheelhouse and the officers' cabins forward, and a volley ball court as well as a swimming pool, a whirpool and a pool bar in the mid area. Large terraces in this area make the pools easily accessible also from the deck above. Aft is the "Wellnesscenter" Spa area with two saunas and a stream bath. The open deck 11 surrounds the pool area on the deck below. Forward is the discotheque "Arkona Club". The passenger cabins, in total 593, consist of four abt. 30 square metre suites with verandah, twelve 24 sq.m. outside suites, 281 A-class de luxe outside cabins, 94 outside B-class cabins and 202 inside cabins. Apart from the largest four suites, all passenger cabins have been prefabricated. The Aida has a gross tonnage of 38,600, an overall length of 193,3 metres a maximum breadth of 32,2 metres and a design draught of 6 m.
The propulsion machinery is diesel-mechanical. The ship has two semi-balanced spade rudders, two bow thrusters and fin stabilisers. The speed is around 21 knots.